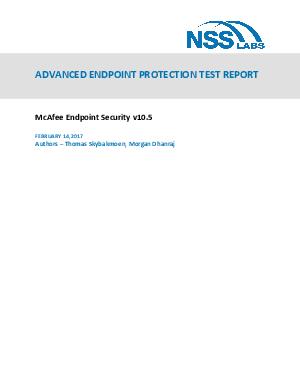 NSS Labs performed an independent test of the McAfee Endpoint Security v10.5 product. The product was subjected to thorough testing at the NSS facility in Austin, Texas, based on the Advanced Endpoint Protection (AEP) Test Methodology v1.0, which is available at www.nsslabs.com. This test was conducted free of charge and NSS did not receive any compensation in return for McAfee’s inclusion. This report provides detailed information about this product and its security effectiveness. Additional comparative information is available at www.nsslabs.com.